Have a question? 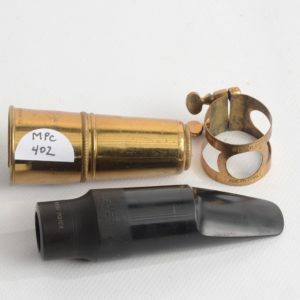 Email at [email protected] to discuss mouthpieces! Beautiful and rare great neck Tonalin 5 tenor. Hard to beat for swing tenor, or for bebop. This is a rare opportunity to buy a new old stock Lawton tenor piece! Lawtons are great because they are not as bright as a Berg Larsen, but not as dark as some Otto Links can be. The large chamber means you don’t sacrifice a round, full tone, and means that it tunes well on a range of instruments. This piece is also made of bronze, which was an upgrade from the regular brass. Generally speaking, solid bronze typically gives you a bit more depth and complexity compared to brass.